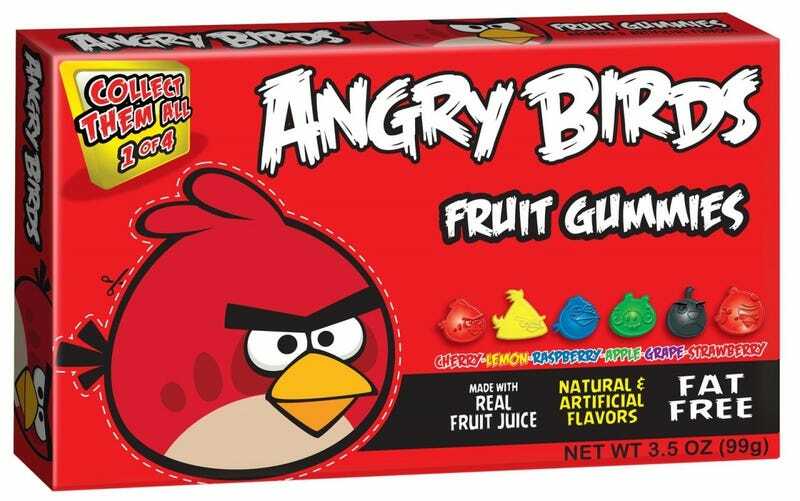 Tonight The Gummi Research Institute™ continues its commitment to American-based artisanal gummi output with a look at Angry Birds Fruit Gummies. Our analysis of Angry Birds Fruit Gummies is a direct reaction to the notion that the subjects for our research are dominated by a few European companies, and that we pay little attention to the exciting things that homegrown American gummi artisans are doing right here on our shores. 1) Angry Birds Fruit Gummies come in SIX exciting flavors: cherry, lemon, raspberry, apple, grape and strawberry. 2) Of these SIX exciting flavors, only raspberry and lemon taste significantly different than the others, the rest being somewhat of an indistinguishable mess. 3) Eating these gummies is much like chewing on colored pencil erasers. 4) These are really, deeply not appealing at all, in any sense. Despite the "REAL FRUIT JUICE." Make it faker, please, but please make it taste better. 5) Do not collect them all, do not pass Go, do not collect $200. Final Gummi Grade: D. The Gummi Research Institute has never given a grade this low, but we're impressed by the race to the bottom, and will look forward to the day when our imagination is challenged enough to offer an "F."